* HIGHLY RECOMMENDED * EXCELLENT VALUE * Sally is both professional and an exceptionally easy person with whom to work. Our office needed an overhaul, but using what we had on-hand and without doing any structural or painting changes. From simply moving artwork around on a wall to completely changing the traffic flow in our main reception, Sally made effective changes that made sense. Although I was apparently born without any design sense of any type, Sally was able to ask the right questions to help our office achieve the goals for which we were looking. Sally worked with me 10 years ago and totally nailed the colors for a new house I was building in Charlottesville Virgina. Although I am still loving the colors and could happily live with them for the next 10, I decided a spring project was needed and and fresh painting for the house would be a great one. What I so appreciate about Sally, is her keen eye, not only for color, but assessing rooms for their relationship to light and the feel of energy one wants to manifest. One of the first questions she asked besides the color palette I liked most, was what feel did I want inside the house with its outside metal siding and lots of tall glass doors/windows. By itself it projected a stark and rather cold feeling, especially with all the metal. And although flooring, curtains and other furnishings help customize, I was amazed at how just the right colors worked not only with the interior of the house, but worked with the lay of the land, house positioning, the natural environment etc. The colors we selected seem to blend with the changing light of day and night and bring such a warmth, and inviting, comfortable feel to the house, which I had hoped for and continue to enjoy. Until meeting Sally I never realized how important the ceiling color is for a room. And she has come up with such yummy shades of color that she knows intimately. Almost everyone who comes to my house, comments on how great the colors are and how much they like them. One room in particular has a bold color of green I never would have considered until Sally. The room is still quite alive, and fun and yet blends beautifully with the other colors chosen. 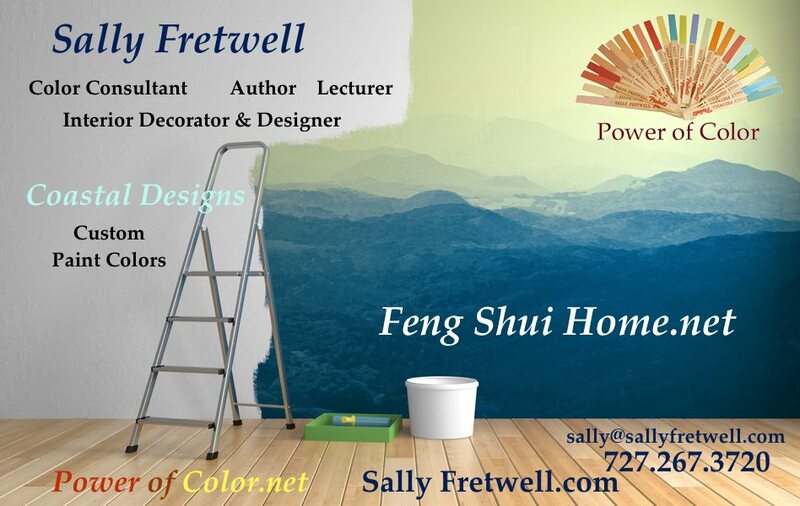 So, I’m now in the midst of an exciting new change with my house that I adore and have reconnected with Sally for another consultation. I feel confident in her knowledge, skill, experience and exceptional talent in guiding me to more years of delight with the play of light and color. ( I might just keep the energizing green because I like it so much.) Thank you Sally for your amazing gift. Your expertise is rare and greatly appreciated.